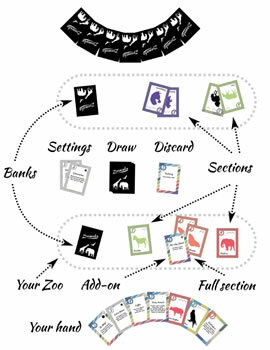 Zoomaka is an eco-friendly printed card game that is great for animal wildlife and humans alike - although humans will have a lot more fun with this game than animals will. In Zoomaka you are trying to successfully create, organize and open your own zoo before your opponent can open their gates. You'll be tasked with saving money, paying debts, creating animal families and performing different action cards. This card game plays quick, is easy to learn how to play and can involve up to five people. As with most games, playing with two people or playing with five can drastically alter various challenges and intensify the fun in different ways. Learn more about Zoomaka and be sure to give it a try today! Review Completed (2017-09-28) We knew when we first saw Zoomaka that it would be a fun game and we were not disappointed. We loved the theme of creating a zoo and loved the simple silhouette animal artwork on the cards. The game rules are fairly straight forward with the basic game play being very easy to learn how to play (only takes a few minutes). There are some specific rules that clarify what happens in different situations due to the action cards (for example: what do you do when you run out of money in your bank?). After just one time through, you'll have this game down. We loved the possibilities and strategy in this game. The fact that some animals can be used in different animal sections opens the door to challenge players to maximize the cards they have. Choosing what to bank and when to play different action cards all plays into the excitement of the game. Some of the action cards left us a little confused as we interpreted it a couple different ways. We made due by all agreeing on a path forward. There is a big difference between playing with just two people and five. For a more simple game keep your opponents to a minimum. For a more nail biting experience where anything can happen, invite a small group over and max the game's players out. 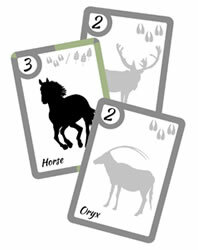 Perhaps the biggest challenge in this game (which adds to the excitement) is the fact that most animal groups only have the exact number of cards needed in the whole deck to complete the section (not including wilds). This means that if someone else has started this section or discarded one of the cards in their bank, you'll have a much harder time completing your section. The action cards do a good job keeping the cards rotating around and make winning possible. Zoomaka is a great card game that is fun for all ages (those that can read). If you're looking for a new card game with plenty of light hearted strategy and luck, then regardless if you're an animal lover or not, you'll love this game. Be the first to collect four full park sections in different colors and you'll win. You get 110 playing cards and the official Zoomaka game rules and instructions. Please keep in mind that the official Zoomaka dice-card rules and instructions could be different depending on the game version you have. The rules below are some of the exact directions on how to play Zoomaka. Share with us your comments, funny stories, tips, advice, strategies, creative ways to play, questions about how to play, problems with the rules or anything you want about Zoomaka. All submissions will be reviewed within 24 hours. Click here to add your Zoomaka comments.